Just like other pets, horses also deserve to be treated as a part of the family and should be given enough care and attention. It is important to create a comfortable space for them which is well- designed and curated making it as comfortable as your home. But, if you are a horse owner, you might have experienced that horses don’t like being confined to a space and require a wide area to move around freely and lie down in comfort. There are proper size recommendations for a stable as laid by the experts that should be followed to create an apt space for the horses without making them feel overly confined. However, you can also opt for custom-made house barn options to help suit as per your building needs. 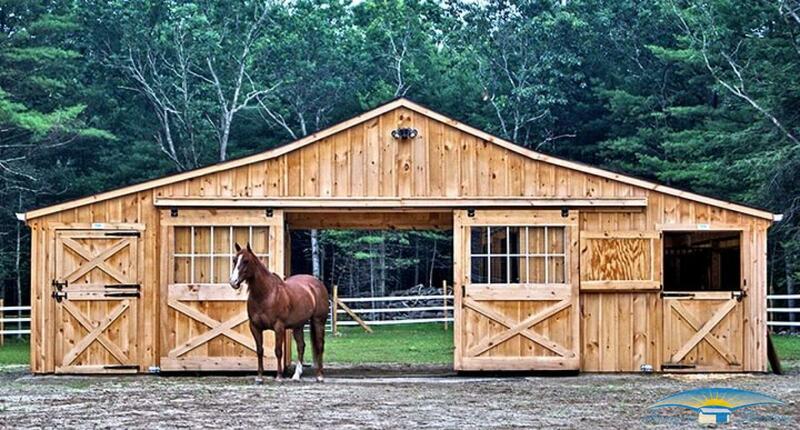 It is another crucial factor that has to be considered while you plan to buy the property to be used as a horse barn. Look for a site that is easily accessible from your residential space and also offers a convenient connection to utilities like water lines, electrical wires and emergency services in case a catastrophe strikes like fire trucks, etc. It is important to find a suitable site to build your horse barn that has a proper drainage system. A bad drainage system would attract flies and also becomes a breeding space for infectious insects that can be detrimental to your horse’s health. You may line the aisles and stalls with slab concrete or choose to leave just the earth floor. Earth floors are easy on horse’s legs and provide warmth, but comes with a difficult cleaning process. On the other hand, concrete floors are non-slippery and easy to clean but gets slightly hard on the horse’s legs. To overcome this challenge, you can opt for installation of rubber mats in the barns to provide additional comfort to your horses. A good ventilation system is a crucial factor in determining your horse’s health. Lack of a proper airflow is known to cause respiratory ailments in horses and a favorable place for bacterial and fungal growth. Barns with low ceilings trap the warm air, suffocating the horses. So, the professional horse stable builders recommend building only high ceilings to pull in the fresh air and natural light. Installing roof exhaust fans and ceilings fans, where horses can’t reach them, will do the needful. Storage of hay in bulk in or just near to the horse barn is highly criticized by professional builders. It is considered to be a bad idea as it increases the chances of fire and rodent infestation. In addition, the bulk hay storage in the same building causes dust and ventilation issues leading to serious respiratory problems for your horses. As per expert recommendations, the bulk hay requires to be stored in a separate area or building to keep your horses safe and sound.